On the coast of the besieged Gaza Strip, 3 Palestinians have been shot by Israeli army life fire, with many more suffering the effects of teargas inhalation. Dr. Ashraf al-Qedra, the spokesperson of the Health Ministry in Gaza, has confirmed three Palestinians were shot with live fire, and dozens suffered the effects of teargas inhalation. Israeli forces shot live ammunition, rubber-coated steel bullets and tear-gas canisters at dozens of Palestinians on Monday’s 17th Naval March, protesting the more than 12 year blockade of Gaza. 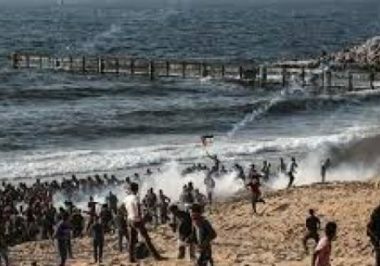 The Maan News Agency has reported that, hundreds of Palestinian protesters at the northern borders of the Gaza Strip being bombarded with tear-gas bombs by the Israeli army, while Gaza fisherman in their boats were fired at by the Israeli navy. The organizers of the Naval March, the ‘National Committee for Breaking the Siege’ have appealed to the United Nations, the European Union and other Arab nations to intercede for Palestinians.